Aus den Kategorien Fallen, Lotterie ! Sie lieben Schokolade? Dann spricht Sie die E-Mail mit dem Milka-Testpaket sicher an. Wer möchte nicht gern Tester für Schokoladenprodukte sein? In einer E-Mail wird Ihnen ein Milka Probierpaket versprochen. Am Ende erhalten Sie jedoch nur Werbung in Form von Anrufen, E-Mails, SMS und Post. Wie das dazu kommen kann? Nicht Milka selber steckt hinter der Aktion. Vielmehr handelt es sich um ein Direktmarketingunternehmen, welches auf Ihre Daten aus ist. Dabei handelt es sich immer um Gewinnspiele von Datenhändlern, die die persönlichen Daten der Nutzer einsammeln, um diese anschließend an andere Unternehmen zu verkaufen. 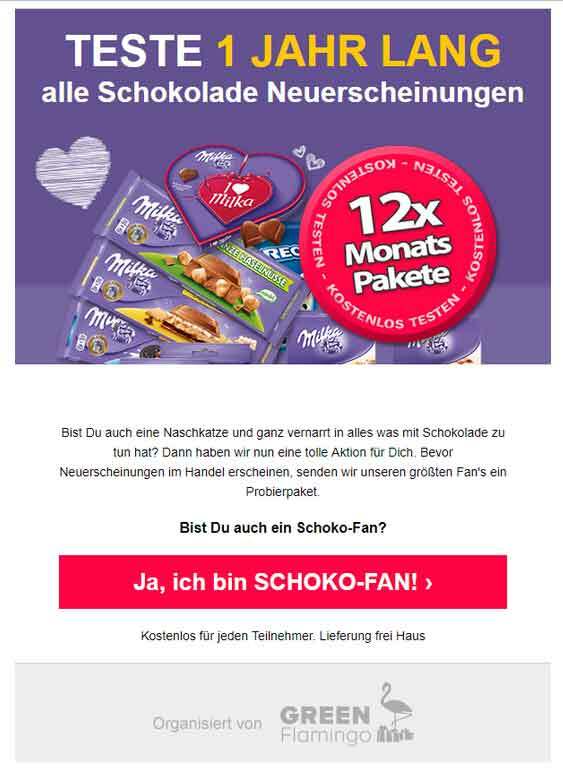 Die Schokoladenmarke Milka hat mit dem Versand der nachfolgenden E-Mail nichts zutun. Sie ist auch kein Sponsor. Vielmehr ist das Unternehmen durch die Nutzung des Markennamens selbst geschädigt. Why are we giving away these AMAZING PRIZES? As part of a worldwide publicity campaign, we’re giving away a FREE award valued up to $3,500.00. This is NOT a joke! By entering this sweepstakes you will also have joined FreeLotto.com. With daily opportunities to win over $11,000,000.00, FreeLotto is the ultimate destination for winning free money online! Since 1999, FreeLotto has awarded OVER $104,000,000.00, created 26 millionaires, and YOU COULD BE NEXT. This is a limited time offer so act fast and act now. After you’ve processed your claim you’ll be notified of exactly what your prize is and we will arrange delivery to you. This is totally free, we even pay the shipping. But you’ve got to act fast. Best of all, after you process your claim you will have joined FreeLotto® – where you’ll get a free chance at winning over $11 million in daily prizes. We’ve already awarded over $104 million in prizes, and you can become our next millionaire! This promotion is sponsored by FreeLotto® and is not associated with any of the above listed brands. The above listed trademarks are the property of their respective owners. This promotion is in no way affiliated with Samsung, Dell, Apple, or Sky Auction. No purchase is necessary to enter. Copyright © 1999-2018 PlasmaNet, Inc. All rights reserved. Reproduction in whole or in part in any form or medium without the express written permission of PlasmaNet, Inc. is prohibited. PlasmaNet, Inc., www.freelotto.com, their agencies and advertisers are not responsible for any incorrect or inaccurate information or formatting, whether caused by internet users or by any of the equipment, programming or software associated with or utilized in connection with the Sweepstakes. Void where prohibited. PlasmaNet, Inc. is not responsible for any errors or omissions. PlasmaNet Inc. PO Box 4562, Grand Central Station, New York, NY 10163, USA. --> Dieser Post gehört zu den Kategorien Fallen, Lotterie | Kommentare deaktiviert für TESTE 1 JAHR LANG ALLE MILKA NEUERSCHEINUNGEN!